this size large only took less than half of a skein! that means two adult sized hats out of one skein. awesome. 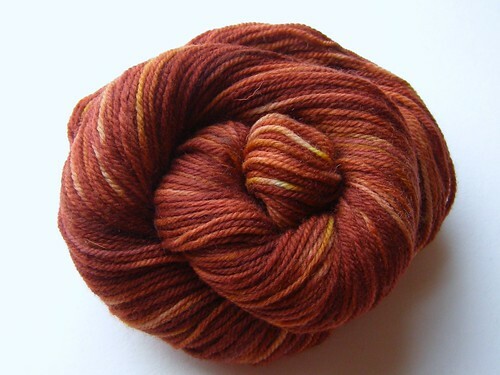 if you’d like your own skein, you can see the skeins that i have available here. but since I have one half of a skein left, what better thing to do than share the love? if you’d like the other half of this lovely skein and a copy of the permafrost hat pattern, comment on this post. you have until monday 10 pm eastern time to comment and the winner will be chosen by a random number generator. Awesome pattern and yarn, Cosy!! My husband needs a new hat…. 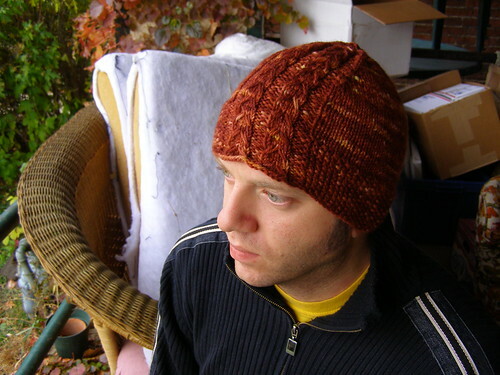 well…after (ahem) i finish a certain lap blanket, i would love to knit this hat. i’m in love with that rusty reddish/orange, so if i were to win, i’d probably have to keep it. but this pattern looks fantastic, and i have a few potential holiday hat recipients in mind. Beautiful color! Maybe just the project I need to learn to cable…? what a wonderful hat, just love it and the yarn is mmmmmmmmmmm. Oooh, happy fall colors. I just finished making 5 hats for other people. I think making this one for me would be perfect. hmm, I could learn cables! I saw this on Ravelry this morning and immediately queued the pattern! Would love to win and get knitting that gorgeous color. OH….lovely hat and colors. I would love a chance. Ooooh, yes please! That is such a beautiful colorway. prettiest color i’ve seen :) the hat is gorgeous as well! Beautiful! I’m on a hat binge right now. The hat looks beautiful in that yarn. I’d be sorely tempted to make that hat for myself but it would also make a good gift for a friend of mine. I’s definitely love that hat for me. But I’d probably make it for my niece, who is freezing her oversized head/hair at college in Boston and asked me for warm handknit hats for her holiday gift. How can you not love a request like that, texted while walking across campus this week? awesome!!! i’ve been head over heels in love with that color lately. that’s a neat giveaway. 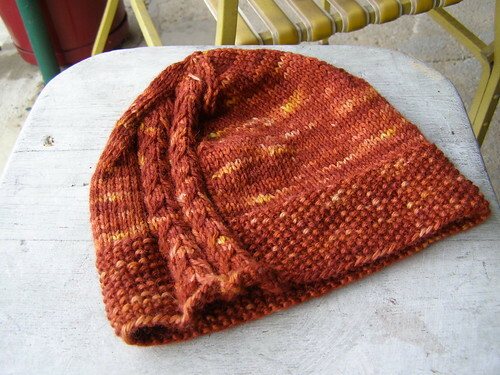 Permafrost hat in lovely fall colours! Love both! Have been admiring your yarn since I bought your book and joined your blog. 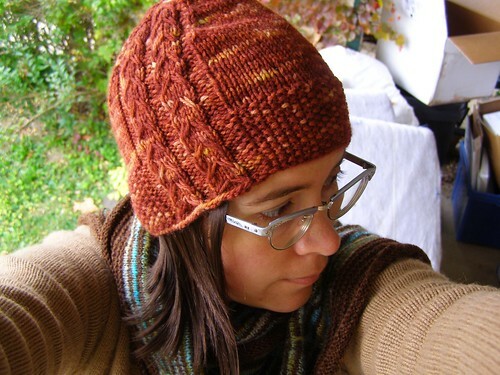 That’s a lovely hat, and gorgeous yarn. love the pattern & the yarn! Very nice! I bet this would be an excellent pattern for holiday gift projects as well. I would love it! What a beautiful color, and the hat is already in my queue. This is one of your MANY hats that I admire. But I didn’t know you had yarn too – that could mean trouble for my yarn diet! That’s a cute pattern and I love the colour! Thanks for the giveaway, Cosy. Oh, I’d love to win this :) I love the color and the pattern. I would totally love to have this yarn and pattern. The yarn is just beautiful. Another great pattern and yarn pair! Fingers are crossed!! What a lovely color/pattern combo, I would love to knit that! Mm I love your bulkier Rainbow Chard, I’d love to try the snap dragon too! Oh, what a cute hat! And perfect timing – the impending winter is easier to face with a new hat. I love the hat. The color reminds me of pecan pie. Yum! i’m knitting a jumper of yours at this moment. lovely. thank-you. Yep. I definitely want to be included in the drawing. :) LOVE the colors of the yarn & the pattern! Great hat pattern and love the wool color. This is time of the year I start making hats, so this giveaway is perfect timing! Thanks for being so generous. A perfect project for fall. Oooh, pretty! I love the colour and pattern both. I’m in the UK, so I don’t know if I’d be eligible, but I hope so! Love the pattern and the yarn! Pick me! me me! :) I love the yarn and the pattern! It looks great without being too complicated! Gorgeous! Love the pattern AND the yarn! What a fun design and beautiful yarn! Can’t get enough of those autumn colors! Would love to win! It’s fabulous! Would love to try it with that beautiful yarn! That yarn is so aptly named…it definitely looks like snapdragons…beautiful! And thank you for the thought to share half of your skein with us!!! That yarn is autumn in a skein. Gorgeous new pattern, & as always, edible yarn. Thanks for the giveaway! aaaaacck that’s the prettiest yarn ever–seriously my colours. Oh wow! I love these colors. So pretty! I would be happy to finish off your half skein of yarn on your lovely pattern. Thank you. It would be so cool to share a skein with you. I have been wanting to practice the cable stitch, always need hats for family and charity projects, and your yarns are lovely. All this Love rolled up in one give-away. Wonderful! I love this hat! Thank you for the contest idea. Can’t wait to see who’s won! Oooh, lover-lee pattern plus yarny combo. Thx for considering me! Love this pattern and the yarn ! Looks like it is universally flattering. Looking forward to doing this one.